Home » Life » Happy Halloween! Hope you enjoyed this year’s spooky holiday. 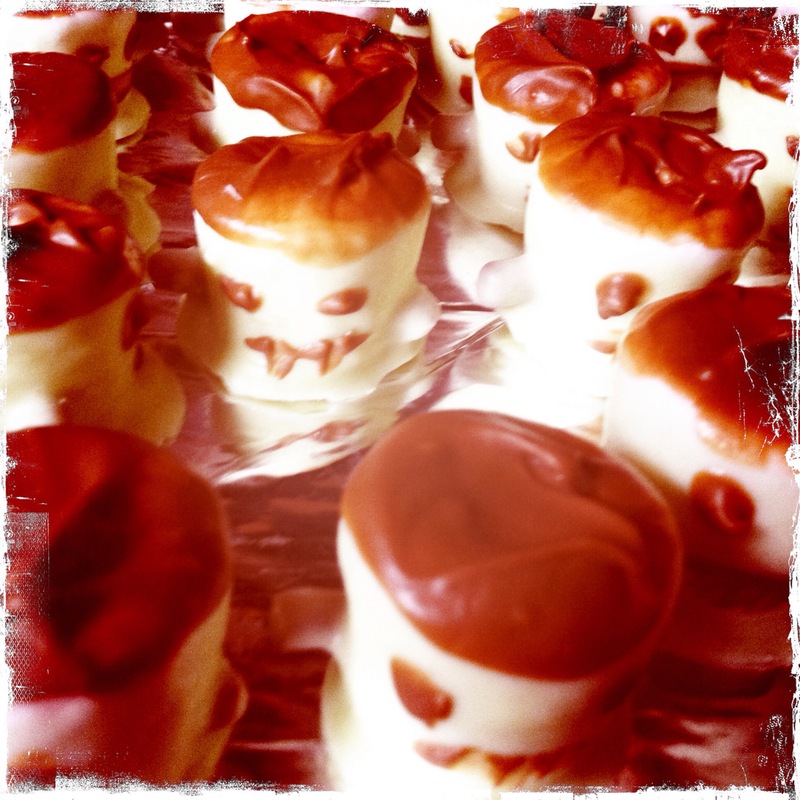 We started our day by getting in a spooky mood making some tasty Halloween treats. We spent some time yesterday searching for some good Halloween-themed treat ideas, and in the process we discovered a great blog called The Pastry Affair. 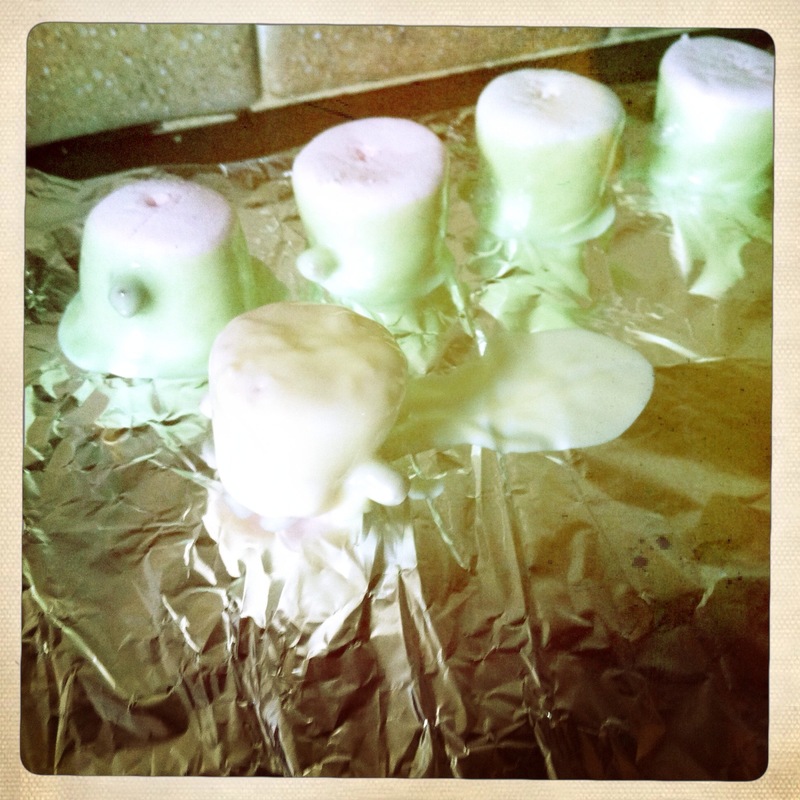 As soon as Charlie showed me The Pastry Affair’s Frankenstein’s Marshmallow Pops, our decision was made. 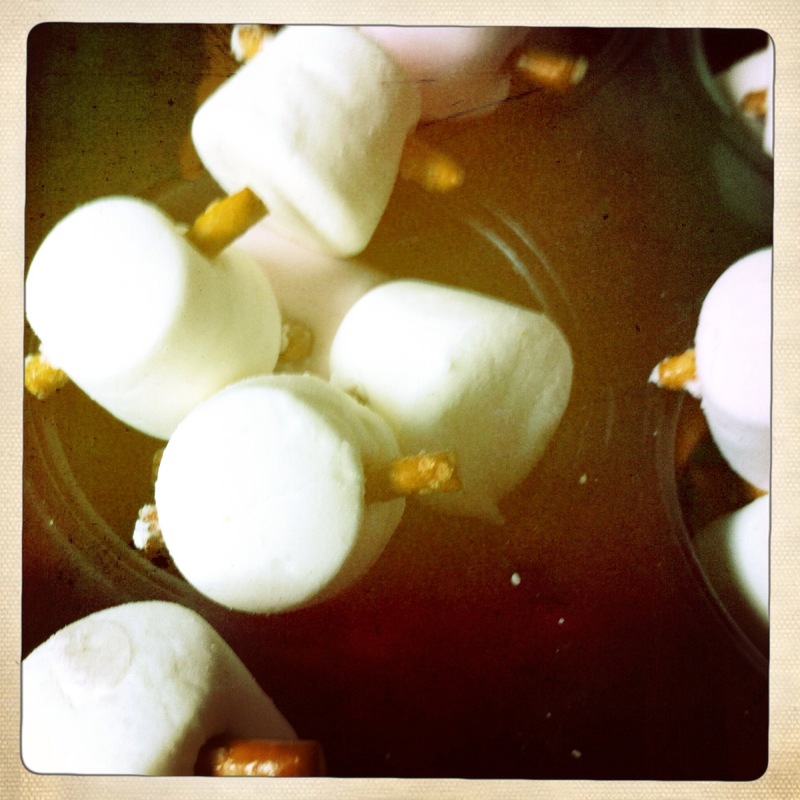 Step 1: Stick pretzel sticks through the centre of your marshmallows to create "bolts"
Step 3: Use melted milk chocolate to add the hair and paint on the face. Now our finished treats weren’t anything near as fantastic looking as those pictured on The Pastry Affair, but they were still delicious, and they went down very well at the Toddler Halloween Party that we went to this afternoon. 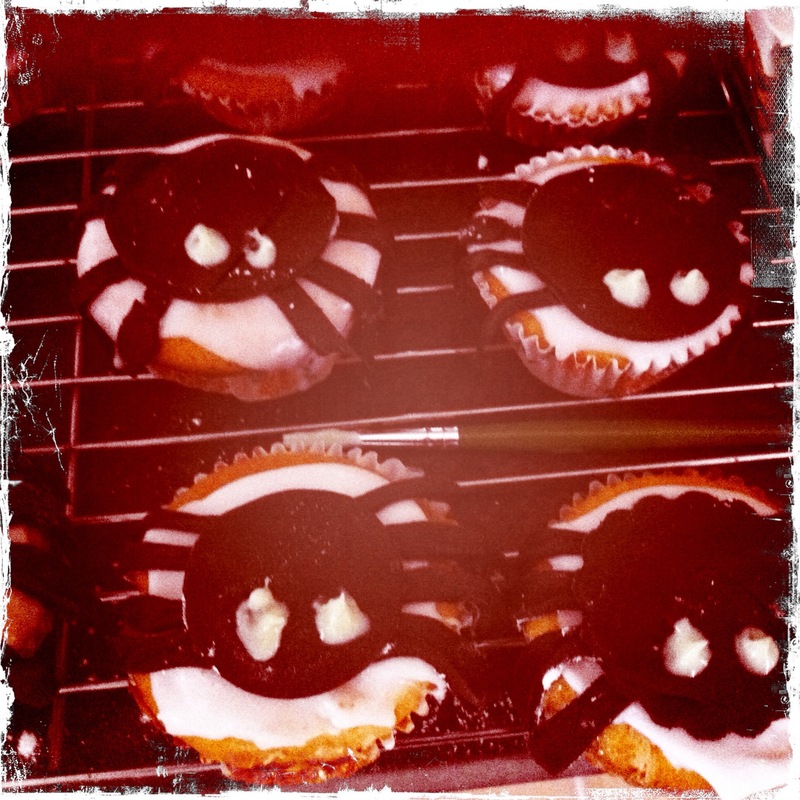 We also made some creepy spider cupcakes using some ready-made colored icing to decorate buns. We coated the buns in Royal Icing first and then cut strips of black icing to make the spider legs, and used a cookie cutter to make the circular body, and dabbed on some leftover melted white chocolate (though I guess it was really green chocolate!) to make the eyes. We were all set for the Halloween party. Charlie and I got dressed into our costumes, and we tried to dress Little Man in his costume – but he was having none of it! I wouldn’t mind, but we had a selection of costumes for him to pick from – a tiger costume, a vampire bat, and a Monsters Inc costume. No way! “I not like,” he shouted. He refused each of them in turn. 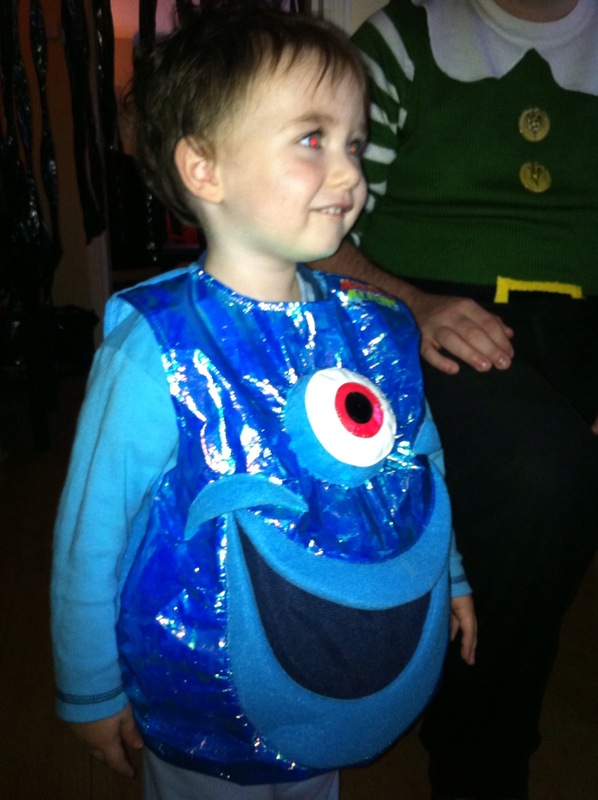 Eventually we convinced him to wear the Monsters Inc costume, with a promise that he could take it off as soon as we got to the party. Sure enough, five minutes after we got there, he asked to take it off. At least he wore it for a few minutes I guess! Thanks to Carol for yet another fantastic Halloween Party! It was wonderful seeing all the Mammies, Daddies, and Toddlers in their costumes! Well Charlie did most of the work, Ady, so you can thank him! They were tasty alright! Where is the picture of mammy and daddy´s costumes?? ?